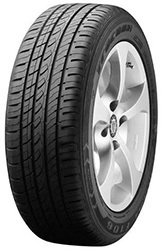 F106 tyres from Rotalla give you the best in performance you could ask for on any journey. These are extremely reliable tyres that won’t let you down and provide fantastic levels of grip, stability and sharp handling so that you can get the most out of every journey. F106’s deal remarkably well in wet or dry conditions and this versatility makes them a great choice no matter where you are going. Reduced road noise and improved water dispersion levels help make these Rotalla tyres more appealing.